Graduate student Yongqiang Wang has won the Best Student Paper Award for "Best OR/MS-focused Paper" at the 2010 Winter Simulation Conference, the premier international forum for the field of system simulation. The paper, "Model-based Evolutionary Optimization," presents a new framework for solving global optimization problems by establishing a connection between evolutionary game theory and model-based optimization algorithms. Wang wrote the paper with his advisors Professor Michael Fu (BGMT/ISR) and Professor Steve Marcus (ECE/ISR). The paper will appear in Proceedings of the 2010 Winter Simulation Conference. Wang is currently a Ph.D. candidate in the Electrical and Computer Engineering Department who received his B.E. and M.S. degrees at Zhejiang University in Hangzhou, China. 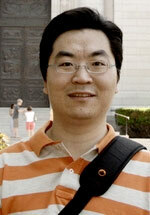 Wang also won the INFORMS Computing Society (ICS) 2010 Student Paper Award in 2010.